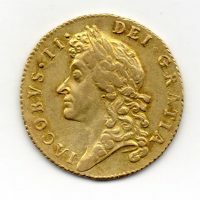 1687 Crown, James II laureate bust, reverse, crowned cruciform shields, TERTIO on edge, extremely fine, a pleasing and attractive example of this issue, rare. 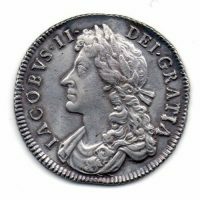 1687/6 Guinea, James II, second laureate bust, reverse, crowned cruciform shields, sceptres in angles, nearly extremely fine, very rare. 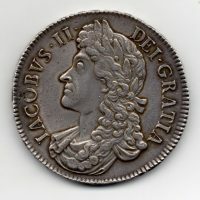 1685 Shilling, James II laureate bust, reverse, crowned cruciform shields.